Gough, Barry M.. "Sailing Ships". The Canadian Encyclopedia, 26 April 2018, Historica Canada. https://www.thecanadianencyclopedia.ca/en/article/sailing-ships. Accessed 19 April 2019. Early Canada developed during the age of sail. 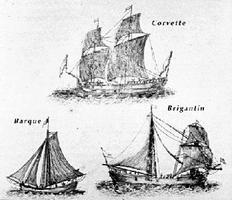 Many of the ships crossing the Atlantic were scarcely larger than the corvette or the brigantine. The barque is typical of those that plied the St Lawrence transporting passengers and cargo between Québec City and Montréal (courtesy Salle Gagnon, Bibliothèque municipale de Montréal). Canada's early history occurred during the great age of sail, when sailors "under canvas" crossed the Atlantic in expeditions of trade, colonization and exploration. 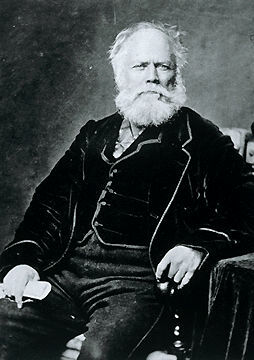 By the mid-19th century Canada had become a major seafaring nation. Canada's ports were crowded with sailing vessels, shipbuilding yards flourished, and Canadian ships sailed every major ocean and visited every major port doing the world's business. In Canada's age of sail (1800-75) over 4000 ships, each exceeding 500 tons burthen, were built in Canada. In 1878 Canadian-registered ships numbered 7196 and totalled 1 333 015 tons. Among the nations, Canada stood fourth in seagoing tonnage. What accounts for this phenomenal Canadian contribution of "tall ships"? Canada had an abundance of good timber - tamarack, spruce and especially pine - near shipyards, which were established in secure harbours and river mouths. Canada also possessed good ship designers and shipwrights, and Canadian builders were able to sell their vessels to US, British, Norwegian and other seaborne traders. Canadian vessels were given the highest quality rating - 14 years A 1 - by the marine insurer Lloyd's of London. Canadian ships were built at numerous locations. The first lumber carrier, the Columbus, 3690 tons, was built at Ile d'Orléans in 1824. The 2459-ton W.D. LAWRENCE, launched at Maitland, NS, in 1874, was the largest wooden full-rigger built in Canada. Other famous ships of this period include the MARCO POLO, launched at Saint John in 1851, which made her name trading to Australia during the gold rush; the square-rigger Canada, 2138 tons, launched at Kingsport, NS, in 1891, which ended her worldwide trading career in 1926; and the square-rigger City of Toronto, built on the Great Lakes. 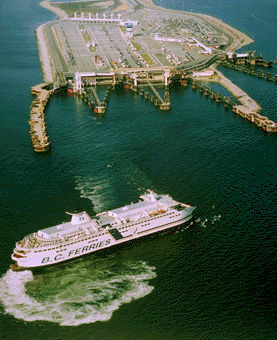 Canadian ports constructed a variety of smaller commercial craft. Victoria, eg, built sealing vessels; ports on the St Lawrence built one- or 2-masted traders; Atlantic yards built whalers, sealers, and fishing and trading schooners such as the BLUENOSE; York and Mackinaw built boats for specific needs determined by geography. Canada also built naval ships. The 3-decker HMS St Lawrence, launched at Kingston in 1814, displaced 2304 tons and carried 112 guns and 1000 men. HMCS Venture, built in Nova Scotia in 1937, was a 3-masted schooner for officer training. At important centres from Halifax to the lower Great Lakes, smaller naval vessels were built, maintaining shipbuilding traditions dating from Talon's shipyards in Québec and La Salle's GRIFFON, launched on the Great Lakes in 1679, and the British brig Ontario, launched at Oswego in 1755. Canada's age of sail came to an end gradually with the introduction of steam propulsion and iron hulls, masts and yards. 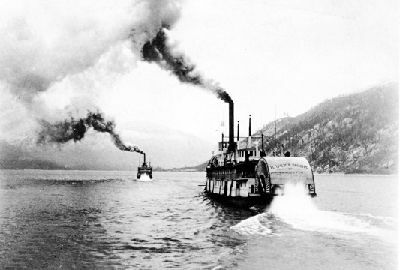 Paddle steamers came first to the St Lawrence in 1809, to the Great Lakes in 1817, and to the Pacific coast in 1835 (see STEAMBOATS AND PADDLE WHEELERS). 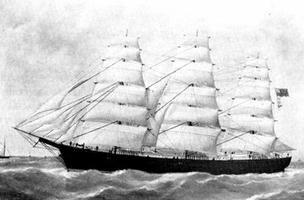 In 1833 the Québec-built ROYAL WILLIAM became the first merchant ship to cross the Atlantic primarily under steam. Canada's shipbuilding industry made the transition to steam and iron, but the 200-year age of Canadian ships under canvas was rapidly coming to an end, and with it came the nostalgia of an age when Canada was known for its great sailing ships. See also SHIPBUILDING AND SHIP REPAIR; YORK BOAT. T.E. Appleton, Usque Ad Mare: A History of the Canadian Coast Guard and Marine Services (1968); C.A. Armour and T. Lackey, Sailing Ships of the Maritimes (1975); L.R. Fischer and E.W. Sager, Merchant Shipping and Economic Development in Atlantic Canada (1982). Bluenose IIThis site offers the latest news and videos about the relaunch of the Bluenose II schooner in Lunenburg, Nova Scotia. Also offers an illustrated history of the original "Bluenose." The Sailing Yacht Canada Restoration ProjectInformation page about the restoration of the the Sailing Yacht Canada. BluenoseWatch the Heritage Minute about the legendary Canadian schooner Bluenose from Historica Canada. See also related online learning resources.